The U.S. 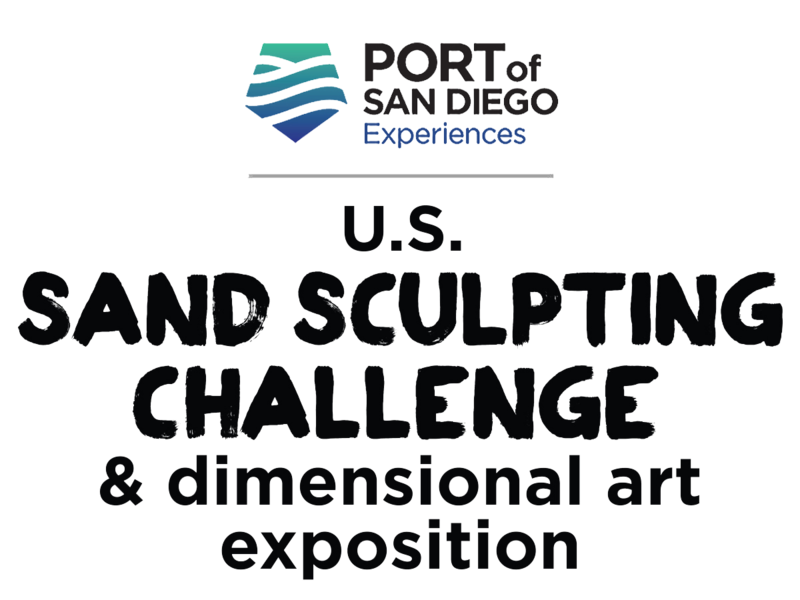 Sand Sculpting Challenge and Dimensional Art Exposition is open to the public for 3 days: Saturday, Sunday and Monday, Aug 31-Sept 2, 2019. Event is held rain or shine. (Of course “It never rains in Southern California.”) Competing sculptures in World Master and I.B. Challenge categories are under the roof of the Port Pavilion Building on the pier. Enjoy balmy bay breezes while you stay in the shade of the 30 foot high ceiling. DIMENSIONAL ART EXPOSITION. Because our giant sand sculptures (see below) would seriously mess up your carpet, we encourage guests to browse and buy more than 1,000 hand-crafted works of art in media like metal, glass, ceramics, wood, fabric . . . home décor, clothing and accessories, jewelry and more by hand-picked artists from throughout California and the Southwest. They’re on display every day on the front half of the beautiful Broadway Pier. LIVE BIG BAND ENTERTAINMENT. On our Main Stage, LIVE BANDS that pay tribute to great musicians like the Beatles, Beach Boys, Bob Dylan, Journey and more — even Elvis! KID ZONE. Rides and activities for kids are scattered around the pier, from the Broadway Landing to the West end. A giant sandbox, of course, with frequent appearances by professional sand sculptors who teach your kids how to build sandcastles. More fun activities too, like a European Bungee Jump, Bubble Fun that lets your kids walk on water (yeah, we know, grandma and grandpa think they do that anyway), a mini obstacle course and more. V.I.P. AREA. If you’re a V.I.P. or just want to be for the weekend (at extra cost of course), you’re invited to enjoy food and drink in a special shaded area with the very best views in the sanddom at the extreme West end of the Pier, almost in the middle of the Bay. V.I.P. ticketholders may come and go all weekend long, get 2 free beverages on their first day (worth up to $16) and have access to an additional private restroom. 10am. Gates open for the day. World Masters solo sculptors are in their final hours of competition. Public voting starts at 2pm (see below). I.B. Challenge. The 3 teams who won it all during the last 10 years of the U.S. Open Sand Castle Competition in Imperial Beach (2002-2011) compete once again. The rivalry actually goes back several decades. Now the second generation is represented, with 4 artists on each team here on the downtown San Diego waterfront. They carve all day today and most of tomorrow. Starting at 10am, you can watch the battle unfold. Dimensional artists exhibit and sell all day. Kid zone activities, food purveyors and refreshing adult beverages are waiting for you throughout the venue. Noon. Entertainment goes live, with some of the best musicians in Southern California. 2pm. Deadline for sculptures in the World Masters Class to have all the details 100% complete. Voting starts for the Peoples’ Choice Awards for the World Masters competition. If you want your voice to count, vote from 2pm today through the night and until 2pm Sunday. It’s all electronic this year. Follow us on Facebook, Twitter or Instagram to learn more about the voting specifics when announced. 7pm. Pooped or not, the bell rings on the first day of the I.B. Challenge Team Competition … to be continued bright and early tomorrow morning. 8pm. Sorry, but it’s dark out and our gates close. Please clear the pier so we can prepare for the next day. 10am, Gates open. All of the World Master sculptors are done and their works are judged by our panel of experts. Some of the Masters will be on the pier at various times during the day, hanging around their art and trying to explain themselves. They are among the most interesting & friendly people in the world and most happy to chat with you. 2pm. This is the deadline for voting for World Masters People’s Choice. Deadline also for I.B. Challenge Team sculpting. All sculptures must now be complete. 5pm or thereabouts. Award Ceremony. City of San Diego and Unified Port of San Diego officials join our all-star panel of judges to present awards in the I.B. Challenge Team and World Masters Sand Sculpture Competitions, and to the non-sand artists judged best in the Dimensional Art Exposition. Dimensional Art Awards. 1st, 2nd and 3rd prize awards are presented. I.B. Challenge Team Awards. Grand Prize, 2nd, 3rd and Sculptors’ Choice winners receive trophies and monetary prizes. World Masters Awards. Trophies and monetary awards are presented for Grand Prize, 2nd, 3rd, People’s Choice and Sculptors’ Choice. Patrons may take a look once more at the amazing winning sand sculptures and the award-winning works of art on the front of the pier, or eat, drink, dance and be merry on the Big Bay. 8pm. Nighttime comes once more and we ask all patrons to clear the pier as we prepare for Labor Day Monday, tomorrow. 10am. Gates open. This is the public’s last chance to view all 20 of the completed, wondrous sand sculptures up close, on their last day on the planet. Yes, sand sculpture is a temporary art form and as beautiful as they are, the sculptures will be destroyed Tuesday morning. Award winners are noted on sculpture descriptions for both the Teams and the World Masters. The competition is over, but some international Masters will stop by the Pier and chat with our patrons. They’ll endure their long flights home tomorrow. All day. Our daily activities continue. Dimensional artists who work in wood, metal, stone, glass and all manner of media exhibit and sell their wares. Live big band music, eating, drinking and soaking it in, continue. And don’t forget the rides, fantastic sandbox with special appearances and lessons from the pros, and other kids’ activities too. 7pm. We close until Labor Day weekend 2020. See you then!